Pixelblaze supports a button on gp0. This pin has a pull-up resistor, and when shorted to ground momentarily will change the pattern. If pressed for more than 3.5 seconds, it will reset the WiFi settings and put Pixelblaze into WiFi setup mode. To wire a button, connect the gp0 and the gnd pin to the button. 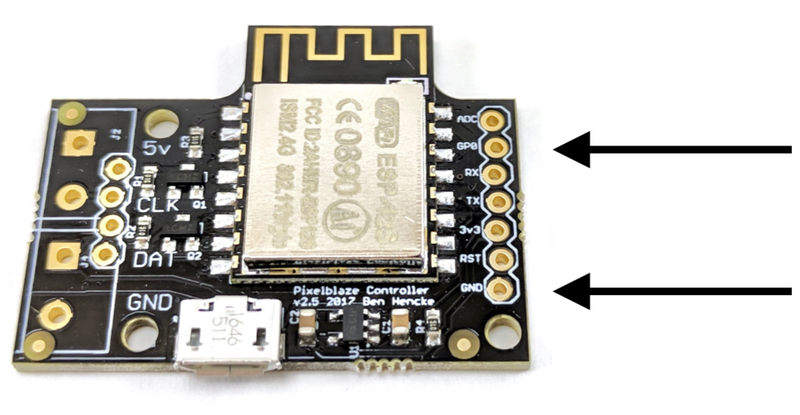 Pixelblaze has a 0-1v range ADC input that can be used in patterns. This can read values from many kinds of sensors or inputs. One possibility is to connect it to a potentiometer to create a dial that controls brightness. 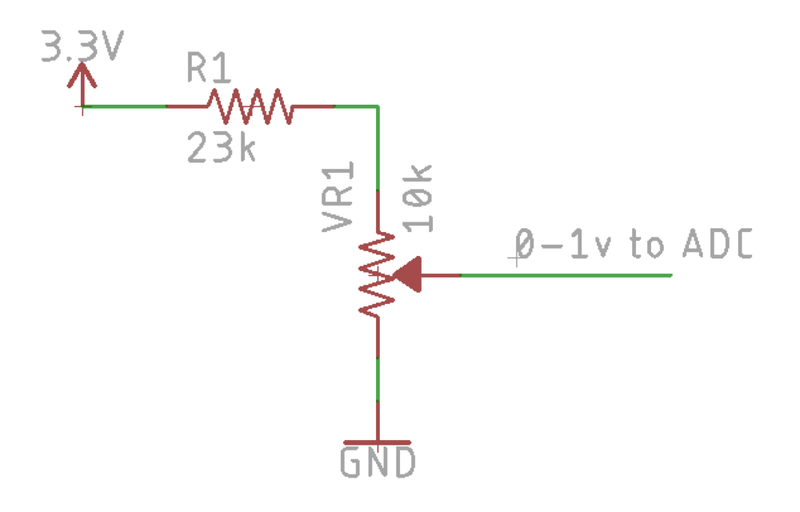 A voltage divider limits the pot's center tap output to 1v. Slightly higher values are OK, for example using a standard 24k resistor instead of a 23k resistor will still keep the output voltage under 1v, it will just max out at 0.97v instead of exactly 1v. You can use this to control all sorts of things! Pixelblaze is controlled by a websocket connection on port 81. JSON and binary frames are sent to control and edit the patterns. Pattern variables can be controlled over the network using websockets. Version 1: If your expression uses but does not initialize some variables, you can set these. They default to 0 if otherwise uninitialized. If you do set them to a value in the pattern, they are overwritten each time and setVars won't take effect. Version 2: You can export top-level variables to make them public and initialize them to default values. e.g. And you'll get a response with all variables. Note that this will only show variable state AFTER the last pixel has been rendered. The pattern list returned contains the name and id, along with some other fields about storage space in memory. In version 2, pattern list changed a bit. It now uses a binary frame protocol for efficiency and to handle potentially hundreds of patterns. The list is split up into multiple binary frames. Each frame has a 2 byte header that indicates the frame type, and a start/end flag field. The rest of the frame is a tab separated value list of ids and names. 2..n id + "\t" + name + "\n" ... Tab separated list of id + names, one per line until the frame ends. With a pattern ID handy, you can activate any previously stored pattern. This change is saved and will persist if the device restarts.